This is my most popular bread recipe, which I've been baking since 2000. It was originally published on A Year in Bread, a joint baking project Beth, Kevin, and I started back in 2007. There were over 170 comments on the original Farmhouse White post, many from nervous novices who are now confident bread bakers. If you're just learning how to bake your own bread, you might find my Ten Tips on How To Bake Better Artisan Breads at Home helpful. I also explain how to shape bread dough into sandwich loaves and offer some more bread baking tips in this post. And you'll find links to more bread recipes in the Farmgirl Fare Recipe Index. 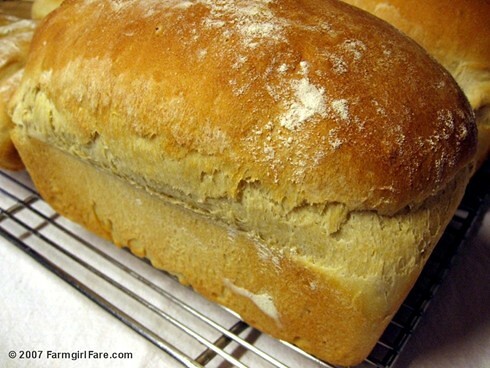 A classic, flavorful white bread made with real milk, not dry milk powder. This really is a very simple and easy recipe, so don't let all these paragraphs scare you away. I wanted to carefully explain each step and answer the questions I'm often asked about making this bread, so the instructions would be clear to beginning bakers. I also included a lot of the helpful little things I've learned during the many years I've been baking and perfecting this bread. Enjoy! 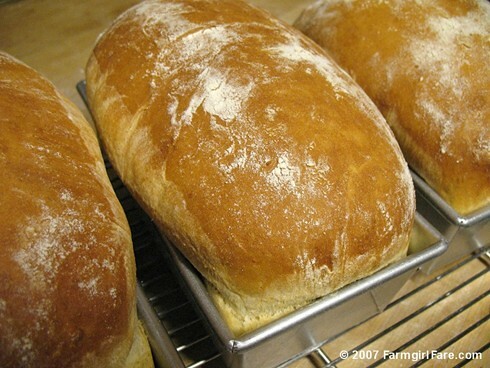 Have you been longing to learn how to bake your own sandwich bread? My simple Farmhouse White is the perfect place to start. It's a traditional loaf that's nice and soft, but not too soft. It's great for just about any kind of sandwich and brings peanut butter and jam (a staple in our house) to a whole new level. It's wonderful toasted, smells heavenly while toasting, and makes an awesome BLT. This is the kind of old-fashioned, homey bread that a few people were lucky enough to grow up eating, and everyone else wishes they had. It's wholesome and filling and about as far from Wonder Bread as a basic white sandwich bread can get. I've watched people who claim they never eat white bread gobble this stuff up. Even if what you really want to bake are hearty whole grain sandwich breads, I encourage you to master a plain white loaf first. While delicious just as it is, Farmhouse White is an ideal building block bread. Once you're comfortable with the basic formula you can, if desired, go on to experiment by adding other ingredients to the dough. This can be a lot of fun, as even a slight change will often give you a completely different loaf. For instance, tossing in just a half cup each of wheat bran and oat bran in place of one cup of the flour creates a pleasant variation that's especially nice toasted. If you replace the all-purpose flour with white whole wheat flour (which is 100% whole grain flour that is made from a 'lighter' variety of wheat) you'll end up with a healthier, heartier bread that still tastes more like white than whole wheat—perfect for those picky eaters. —Substitute one cup of cracked wheat, cornmeal, polenta, or rolled oats for one cup of the all-purpose flour. —Try a cup or two of stone ground rye flour. —Add a few Tablespoons of wheat germ. —Make it with a cup or two of oat flour, which you can easily make by whizzing old-fashioned rolled oats in a food processor for about 30 to 60 seconds, depending on the texture you desire. Oat flour is also great in pancakes, muffins, and scones. —Stir in some honey for a sweeter loaf. —Turn it into cinnamon raisin bread by mixing cinnamon sugar and raisins into the dough, or flatten out the dough and sprinkle them over it when you're shaping your loaves. —Toss in a few handfuls of chopped fresh herbs. —Knead in several cloves of smashed roasted garlic, a few glugs of good olive oil (in place of the other oil), and plenty of freshly grated Parmesan or Pecorino Romano. The possibilities are limited only by your imagination and tastebuds. There are numerous factors that will affect your bread dough, including the weather, the humidity, and the flour you're using. No matter what kind of bread I'm making, I always keep the amount of liquid a constant and vary the flour accordingly. Keep in mind that whole grains absorb more liquid than white flour, so you may want to increase the milk by 1/2 to 1 cup when using them. I usually start with 5 cups of milk when adding whole grain flours to Farmhouse White. Sometimes I'll need less flour than what is called for, sometimes more. Never add all of the flour at once; it's easier to knead in a little more flour than a little more water (though my bread buddy Kevin says that spritzing your dough with a spray bottle of water works great if you do need to add more moisture to it). You can also use this dough to make dinner rolls or burger buns; just reduce the baking time. For individual rolls, place balls of dough a few inches apart on a heavy duty baking sheet lined with unbleached parchment paper (which you can reuse several times), or snuggle them up together for pull-apart rolls. I make rolls that are 2 to 3 ounces and burger buns that are 4 to 5 ounces. A cake or pie pan will give you a nice circle of rolls that looks lovely on the table or presented as a host/hostess gift. For burger buns, I shape the dough into balls and flatten them into thick rounds, then brush the tops with water and sprinkle them with coarse salt just before baking. I've even shaped this dough into free form loaves of sweet French bread (meaning it's not sourdough) and baked them directly on a hot baking stone. A lot of white sandwich bread recipes call for dry milk powder, but I don't see the point of it. If you want more flavor, simply replace some or all of the water in the recipe with milk. For years I made Farmhouse White with water, and it was perfectly fine, but now I always make it with milk. According to Joe Ortiz in The Village Baker (an excellent book packed with interesting tips and techniques for bakers of all levels), making your bread with milk will not only give a richer flavor, but also "a deeper color to the crust and a softer body to the crumb." And when used as an additive to French bread, "milk also helps to provide some of the flavor of a lactic fermentation that happens naturally in a sourdough process." In The Breakfast Book, author Marion Cunningham states that milk, along with sugar and butter (or other fat) "give the loaves keeping qualities which help preserve flavor and moistness." Baking bread is a perfect way to use up milk that has gone a little sour. This recipe makes three loaves of bread because in my opinion, if you have freezer space or friends, there's no reason to bake only one loaf of bread at a time. Bread freezes beautifully—and you won't believe how much your friends will love you if you present them with a freshly baked loaf. I played around with different flours in this recipe and finally settled on a combination of organic all-purpose and organic bread flour, but you can use 100% all-purpose flour or 100% bread flour if desired. The best thing to do is experiment and see what you like. As always, I urge you to seek out local and organic ingredients. They really do make a difference. I buy instant yeast in inexpensive 1-pound packages and store it in a jar in the freezer, where it will keep for at least a year. A digital kitchen scale is great for weighing ingredients, portioning out dough, and lots of other things. I love my 11-pound Oxo scale and often use it several times a day. The pull-out display is awesome. It's also great for weighing postage and packages. A few years ago I started baking all of my pan loaves on the heated baking stone that I use for free form breads, and the results have been wonderful. The bottoms of the loaves are nice and evenly brown, and I think that initial burst of heat directly on the pans makes the loaves end up even taller. Just like with pizzas and free form loaves, you need to preheat your baking stone so that it's very hot when you put the bread in. Never put a cold baking stone into a hot oven. In a very large bowl, stir together the all-purpose flour, yeast, and sugar (I use a wooden spoon). Make a small well in the middle of the flour mixture and pour in the oil and the milk. Mix well, then continue to stir vigorously, slowly adding 1 cup of the bread flour at a time and stirring it in, until you've added 3 to 4 cups of bread flour and have a sticky, shaggy dough; this should take a few minutes. Cover the bowl with a damp tea towel or flour sack towel (not something fuzzy like terrycloth) and let it rest for 20 minutes. (I keep stacks of these and these in my pantry and use them constantly all around the kitchen). This rest period is called the autolyse. Add the salt and 1 more cup of bread flour and stir it in as best you can. Add another cup of bread flour if the dough is still too sticky to knead. Turn the dough out onto a floured work surface and knead it with floured hands until the dough is soft and smooth, about 8 to 10 minutes. As you're kneading, sprinkle a little more flour at a time as needed to keep it from sticking to your hands or the work surface. You want the dough to be as soft as possible without being sticky; you may not need the entire six cups of bread flour, or you may need a little extra. On hot days I use cold milk to make my dough, and on cold days I heat the milk to about 100°F (don't make it any hotter or you'll risk killing the yeast). If you keep your flour in the freezer (it's the best place to store whole grain flours), use warmer milk, or let the flour come to room temperature first. When the dough is ready to be shaped, you should be able to push a floured finger deep into it and leave an indentation that doesn't spring back. 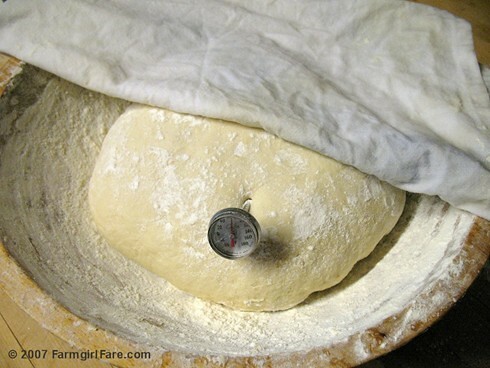 Unless your dough is rising in a straight sided container, it can be difficult to judge whether it has doubled in size, which is the guideline most recipes use. I find the finger poking method to be more reliable. Turn the risen dough out onto a lightly floured work surface, flattening gently with your hands to break up any large air bubbles. Divide the dough into three equal pieces. The easiest way to divide up dough into loaves or rolls is with a stainless steel dough scraper, also called a bench scraper or pastry scraper. I have three, and they're always in constant use. Nothing works better for cleaning up the counter after working with dough or pastry. If you're using a baking stone, put it in the oven now and heat the oven to 375°. Shape the dough into loaves. There are many ways to shape loaves; I give instructions for my favorite method in this post: How To Shape Bread Dough into Sandwich Loaves and Some Simple Bread Baking Tips. Place the loaves seam side down in greased loaf pans and dust them with flour (I use coconut oil cooking spray on all my baking pans, and we also use it when grilling meat). How do I get my sandwich breads so nice and tall? I cram a lot of dough into the pan. I love my Chicago Metallic commercial 1-pound loaf pans. If I want shorter, more square shaped bread, I use my Chicago Metallic commercial 1½-pound loaf pans, which are approximately 10"x5"x3". In the loaf shaping post mentioned above, you can see how much the shape varies when two loaves that weigh the same are baked in different sized pans. Both size pans are also great for baking quick breads, like my Beyond Easy Beer Bread, and cakes, such as this Orange Yogurt Loaf Cake. 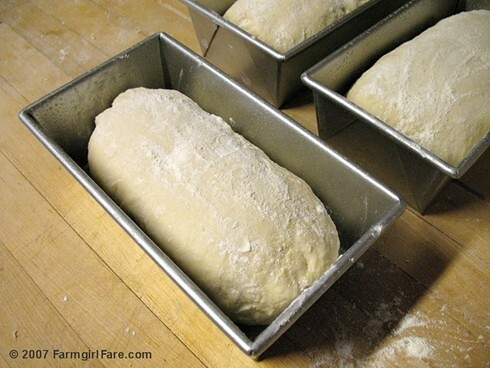 January 2013 update: Looking for a commercial loaf pan that's exactly 9"x5"? Last year I bought this heavy gauge USA Pan, and it's really nice too. Cover the loaves with a damp tea towel or flour sack towel and let them rise until the dough springs back just a little when you gently poke it with a floured finger, about 40 to 60 minutes. If you let the loaves rise too long, they may not have enough energy left to rise once they're in the oven, and they may even collapse. I was always so afraid this would happen that for years I unknowingly under-proofed my loaves of Farmhouse White. This underproofed loaf went in the oven a little too soon. While the bread was still delicious, you can see that the dough had so much 'oven spring' that it basically blew apart the side of the loaf. I finally started letting the loaves rise a little longer and was rewarded with the more evenly shaped and visually appealing bread that you see in the previous photos. Bake at 375° for 35 minutes, or until the loaves are golden brown and the bottoms sound hollow if tapped (you need to carefully remove a loaf from the pan to check this). Remove the loaves immediately from the pans and let them cool on a wire rack. The bread will continue to bake inside while it's cooling, so try to wait at least 40 minutes before cutting into a loaf. Store at room temperature or freeze in zipper freezer bags. I like to use the 2.5 gallon jumbo zipper food storage bags, which will fit two loaves. Make sure the loaves are completely cooled before sealing in bags. Still have some flour left? You'll find links to lots more bread recipes, including my popular Oatmeal Toasting Bread, in the Farmgirl Fare Recipe Index. © FarmgirlFare.com, the freshly baked foodie farm blog where Farmgirl Susan shares recipes, stories, and photos from her crazy country life on 240 remote Missouri acres—and there's bread dough rising even as I type. This looks wonderful! I will be making this tomorrow! Glad I found your blog, I so want to add a donkey or two to our farm! Wow, I love making bread & these loaves look amazing...great job!! I am officially following you...and would be tickled if you would join my food page on fb. What if I only have 1 loaf pan? Is there a way to stagger the proofing of the loaves without sacrificing the texture of the finished bread? I know the simple answer is to just buy more loaf pans, and I hope to soon. Unfortunately, more pans just aren't in the cards for me right now. Very late reply, sorry just found this recipe. You can freeze loaves for proofing and baking later. Just like the frozen loaves they sell in stores. Beautiful loaves! Thanks for posting the recipe here. Looks great. Thanks for the step by step and plethora of notes. I will be trying this soon. Beautiful, just beautiful, luscious home made bread! I still have some of my son's childhood friends remark on their memories of my bread. The little boys would be outside playing in the yard until I told them bread was ready. They would come in the front door and and grab a sliced hunk and slather with real butter and go out the back door and devour! I knew where they were and that they were safe, getting a good after school treat and I was getting stress relief from my job as a medical lab tech from kneading the dough! All positives! Thanks for this wonderful tutorial! I've had less than stellar results with baking sandwich loaves, so I've just been making lots of baguettes. I expect we'll be snowed in the next few days...perfect weather for bread baking! That bread makes me want some of it right now. Yes, warm water will work fine for loaves or rolls. Or you can make rolls with milk. Happy baking! However, being a perfectionist I'm not 100% happy with the taste/smell/colour of the crumb. The crumb is a pale yellow and has a ever so slightly (all I describe as) 'sour' smell and taste. All my ingredients are as fresh as so I know nothing has gone bad. I'm live in the Arkansas Ozarks and we just got hit by the same ice and snow storm you did. And it got down to 10 degrees BELOW zero last night. (And I thought this was the South.) Anyway, where do you put your dough to rise? I tried making some of your oatmeal bread yesterday and the dough just didn't rise enough--maybe because it wasn't warm enough in my house. I love that you baked this bread two days in a row. As for the 'sour' crumb, the only thing I can think of is that it has to do with the milk. If you've never baked bread with milk instead of water before, you might not be used to how it smells - which I think is really good. My suggestion would be to make another batch using water instead of milk and see if you like the results better. If you do try it, I hope you'll come back and let us know how it turned out - you have me curious. Finding a warm place for bread dough to rise during winter if you don't have central heat can definitely be a challenge, but don't give up! Dough will rise just fine in cooler temperatures. It'll just take longer - sometimes quite a bit longer - but the wait will be worth it because you'll end up with a superior loaf. If you can find a place that's at least 60 degrees F you should be good to go. I put my dough near the woodstove in our living room - sometimes on a stool about two feet from it. :) Other warm places might be next to a space heater or a heater vent, or on top of the refrigerator. Back in the good old days when gas ovens had a pilot light that stayed on all the time, the 'cold' oven was the perfect temperature for rising bread dough. Now some people will turn the oven on for just a minute or two to warm it up in there, then turn it off and put the dough in it to rise. You don't want to do this if your dough is in a plastic container, though, just to be on the safe side. 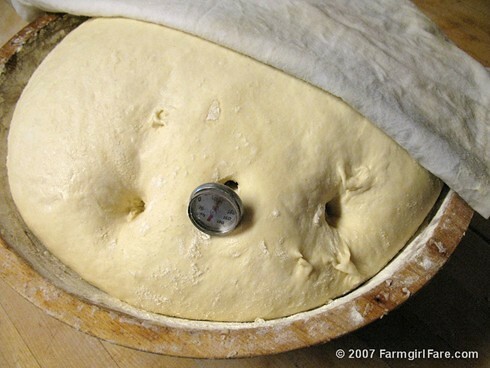 I've even put dough outside on sunny winter days to rise (can you tell I've had a lot of experience with this, LOL?). If it's in a clear plastic container with a snap on lid (something like this kind is perfect), it will actually act as a little greenhouse and warm the dough right up. This could work on a sunny windowsill, too. What I've noticed is that if the air temperature (and the dough) are cool, it can take quite a while - like an hour sometimes - for the dough to even start rising. More than once I've started to panic, but there's no need. Once it finally does start, then it rises just fine. Using warmer than usual milk or water can help give the yeast the initial boost of heat it needs to get to work - about 100 degrees F works well. (This is where an instant read thermometer comes in so handy.) On the flip side, I use this trick in summer to keep the dough in our sweltering shack cool - starting with very cold milk rather than warm. Hmm...I think the computer ate my first comment. Anyways, love this post. I've always wondered how everyone else got their bread so much higher than mine. I've always weighed my dough, so I think the key for me might be smaller pans. Thanks! Glad you are moving those recipes as I go to your year in bread site for inspiration every now and then. Hi! I think I might just be your latest follower. I'm a mere 5 days into the bread baking world and I think I'm quickly becoming enamored if not completely obsessed by the idea of fresh home baked bread. I've studied this particular post for 4 nights straight and I am now half way through my first rise as I type. I was wondering if it is at all possible to 'pause' the process after the first rise. eg.put it in the fridge overnight? I ask this because I would absolutely love to bake a fresh loaf in the morning and have it cooled and ready for breakfast but not have to wake up at 4am to do so. I'm not sure that even bread will help me get through a day in the office with so little sleep. Yes, I am a useless city girl. Your question is a great one, and the answer is yes, you can 'pause' the process after the first rise. After you've shaped your loaves and put them in the greased pans, you can put them in the refrigerator to rise overnight, rather than at room temperature. The cooler air will significantly decrease the yeast activity, so the dough will rise a lot more slowly. You bread will also probably end up tasting even better. I've never tried this myself, but I know it can be done. What I don't know is exactly how long it will take your loaves to rise completely in the fridge - and this will of course vary depending on the bread you're making. If you let the pans of dough rise overnight and they're not quite tall enough in the morning, simply take them out and set them on the counter to finish rising. If they've risen too much, though, they won't have enough energy left to 'spring' up when they hit that first blast of heat from the oven - and they may even collapse. For your first attempt, you could try making your dough very early in the morning, and then checking the loaves in the fridge throughout the day to get an idea of how fast they're rising. Or you could make the dough and shape the loaves late at night and get up early to check them. Remember that you'll also have to allow enough time in the morning for the oven to heat up before you put the loaves in. —Let two of the loaves rise on the counter, bake them off that evening, and then freeze them for later (though this will require heating up the oven twice). —Put some or all of the pans of dough in a large cooler with ice packs to rise, rather than the refrigerator. —Reduce this recipe so that it makes just one loaf - see my measurements in a comment above. One more thing - when you put the loaves in the fridge, I would cover them with a damp, lightweight tea towel (not terry cloth, which will shed lint) so they don't dry out. A dry 'skin' doesn't give you as nice a loaf. This is what I do when the loaves are rising on the counter, too. I made a single loaf of this yesterday and it came out beautiful. I didn't have the bread flour, so I used KAF all-purpose, and I didn't add the oil (in my case melted butter) at the right time so I mixed in before kneading. Also, I used a mixer with dough hook instead of kneading by hand. I'm a fool in the kitchen, and this bread is foolproof. This is my new white bread recipe. I have been using a different,very easy recipe until now (I'm new to bread making) but it's time to move on to something slightly different. I'm going to try this recipe tomorrow. I'll let you know how it goes. I just finished making this bread and tasted a slice. Fantastic. I used rapid rise yeast (all I had) and only 1 tablespoon because I am not the biggest fan of yeasty taste. It was perfect. YUM!!! Finally found time to make this bread. Didn't use as much flour and I have a random assortment of glass and metal pans in different sizes but it came out wonderfully. I have not made bread that sliced so well and my boys loved it. One commented to a friend who was over that he was "having the best snack ever, farmhouse white with butter and honey, HOMEMADE farmhouse white" it was very cute. I just came across your site and what can I tell you, love at first sight (no pun intended. :) I love the tips and most of all, that you provide metric measurements as well. Not only what I'm used to but it does allow for more precise quantities. Hi I was just wondering if you brush the tops of your loaves with anything to make them so brown and shiny? It sure does look like I brush the tops of the loaves with something, doesn't it? Even I started wondering about that when I looked back at these photos. But last night I took three loaves of half whole wheat Farmhouse White from the oven and noticed the same thing. The loaves you see in the second photo from the top went into the oven looking just like that. After I shape the loaves, I dust them liberally with flour and then I cover them with a damp tea towel. The flour (usually!) keeps the towel from sticking, and I also like the homestyle look of flour on the finished loaves. The damp towel keeps the dough moist, which allows it to rise better in the oven. I've made this a number of times, and it's hands down the best toasting bread I've eaten. That said, it's kinda a pain, at least when I've made it, to get the PB or Nutella on it. Is there a way to make it more spreadable? I'm always ripping up the white when I put on the spreads. I'm so glad you're enjoying this bread. Part of its appeal is that the crumb is nice and soft, but you're right - it can be difficult spreading peanut butter (and oh, nutella - what a delicious idea) on it without ripping it up. We eat a lot of pb&j sandwiches around here, and our organic peanut butter, which is kept in the fridge, is dense and hard to spread. What we usually do is toast the bread very slightly (on the lowest toast setting of our little Oster toaster/convection oven) so that it helps melt the peanut butter. If the peanut butter is really hard, I'll put it on the bread as best I can, then stick it back in the still warm toaster oven for a minute or two to help it soften up. That said, this morning we opened a new jar of pb, and after stirring it up to mix in the oil, it's usually pretty thin and spreadable (on warm days at least), so we had our pb&js on untoasted slices of last night's freshly baked Cornmeal Farmhouse White, which was a nice treat! (Recipe hopefully coming soon, but basically you use 5 cups of milk and replace 2½ cups of the white flour with stoneground cornmeal). If you don't want to toast the bread, you could try heating up the pb or nutella slightly before spreading it. If your bread is *really* soft - like if you have trouble even spreading mayo on untoasted bread - you might try baking the loaves an extra two or three minutes and see if that firms up the crumb a little. Love this bread! I make it every week as our daily sandwich bread. I also make rolls from it for dinner during the week! I've been baking bread ever since my family lived overseas on a G.I. salary. After 30 years of making bread by hand I thought there wasn't much new for me to learn, but your excellent instructions and methods showed me I was wrong. This easy recipe makes consistently great bread! I've reduced it to make a single loaf (our small oven here in China can't accommodate more) and we make one every week. This looks delicious. I'll be making this next. One question, do you think the dough could stand up to being split on top? I rather like the asthetics of slit loaves but I've learned the hard way that some doughs will collapse if I do. I just made your farmhouse white today and it came out wonderful!!!! I do have a question though. When you bake 3 loaves out of this recipe how tall are your loaves when they are finished cooking? Not sure if I should have let mine rise longer. I'm so glad you enjoyed the bread! My apologies for the delayed reply to your question. As for the height of my loaves, when I use these larger loaf pans my Farmhouse White comes out about 4½" to 5" high. With both sizes, I let the dough rise well over the rim of the pans. The difference between an 8" loaf pan and a 9" loaf pan doesn't seem that great, but it is. You can see an example of how much taller the 8" pan loaves are than the 9" in this post on how to shape bread dough into sandwich loaves. Just made this loaf today, and it was excellent! I wanted to drop you a note that I found this recipe on A Year in Bread... a year ago? 2 years ago? I've been making it ever since! We made a few modifications to it (replaced the all purpose flour with white whole wheat, plus some ginger to help the yeast rise better). My family doesn't want to eat store bought bread now, so I've been making this at least once a week. You're very welcome! I'm so happy you're enjoying this bread so much. My apologies for the delay getting back to you. As far as keeping the bread as fresh as possible, I don't have any suggestions other than to freeze it, which you're already doing. Are you freezing the two extra loaves as soon as they've cooled down? It's easy to perk up free form crusty loaves by simply putting them back in the oven to heat up (and some people swear by spritzing the loaf with water - or even quickly running it under the faucet - first), but you definitely don't want to re-bake sandwich bread. and wanna thank you for sharing your knowledge and experience with us, you've been so helpful! I'm a beginner and i tried your recipe last week, the bread came out a little dry, i must say i used only all purpose flour (white flour) could that be the problem? i'm intimidated because everyone got a perfect loaf but me!thanks again! Ive made this before you moved it to this sight.. I couldnt find the recipe had on my computer before so I looked it up here I have tried to make three times following this one above and I cant get the bread to rise.. I used the bread machine yeast that comes in the little jar for the fast acting yeast. This is what I used the last time I made this and it will not rise...did you leave out a step.. Was I suppose to kned this before the auotlayse? Hello down in Mexico and congratulations on joining the wonderful world of homemade bread! If your bread came out dry, it could be two simple things - you baked it a little longer than necessary, or your dough was a little too stiff. All flours vary - even batches of the same brand can vary - and so many other things like weather and humidity can affect how much moisture is in your flour and how much of the liquid in your dough it absorbs. This means that you won't always need the exact same amount of flour for each batch of bread. Because you're in Mexico, your flour might be a lot different than what I'm using (not to mention your different weather), so you'll want to experiment with how much you need. While you're kneading, you want the dough to stay very soft, but not so sticky that it sticks to the counter and/or your hands. If it's too sticky while kneading, just add a sprinkling of flour onto the dough and/or onto your hands. Keep doing that if it continues to get sticky. When the dough is softer, it will also rise better in the pans and in the oven. Sorry to hear about your bread baking troubles. My first guess is that your yeast might not be good and needs to be replaced. I recommend using instant yeast. There's a lot of confusion regarding different types of yeast - and sometimes instant yeast is also called bread machine yeast - but the 'rapid rise' yeast is not the same as instant yeast. You can read more about the different types of yeast here. I never have good luck with those small packets of yeast, so I buy my instant yeast in economical 1-pound packages and store it in the freezer, where it will last for at least a year. Click here to see an example of the packages of instant yeast I use. Even if you don't bake bread that much, a larger package of yeast is usually still a better deal than buying those pricey small packets. As for the instructions, I didn't leave out a step. You don't have to knead the dough before the autolyse, but you do want to add the flour 1 cup at a time and stir well after each addition. For many years I kneaded the dough before and after the autolyse, but after much experimenting with this and other recipes, I discovered that a vigorous stirring was all that was necessary - thereby saving a few minutes of kneading. You only have to knead the dough after the autolyse - which is just a rest period that allows the flour to absorb the liquid and the gluten to relax - not an official rising. Hi. I have made bread on and off for about six years and I am sure I have never had a dough as soft and silky and beautiful as this. I'm hoping that says more about this recipe than it does about my skills. Rolls are rising now. Cannot wait to taste. Thank you for sharing this wonderful recipe and this excellent site. The first time I made a loaf of bread, I was a teenager, and I fell in love with the art of bread making. I look forward to trying your recipe. Thanks for the recipe. I'm always on the look out for a bread recipe. I only have two loaf pans so I was thinking about keeping the last bit of dough in the fridge to bake another day (developing the flavor too!). At what point in this process would you recommend that? Before the first rise or after? I haven't tried refrigerating the dough overnight, but I would recommend putting the third loaf's worth of dough into the frige right after you finish kneading it. It should rise slowly in the refrigerator for a while and then stop - I think! Then shape the dough into a loaf, let rise in the pan, and bake. I know someone who used to shape the loaves in the early evening, put them in the pans, and then let them rise overnight in the fridge. You could also try that, but you'll want to check on them first thing in the morning to make sure they haven't risen too much. Or you could simply use the rest of the dough to make rolls, burger buns, or a free form loaf - all of which can be baked on a heavy duty baking sheet. I often make 2 loaves and then a tray of burger buns - getting 8 good sized buns out of one 'loaf.' Bake the rolls/buns first (for about 25 minutes) and then bake the loaf pans. You can put the loaf pans in the fridge, a cool place in your home, or even outdoors to for part of the extra rising time to keep them from rising too much. i've never had enough luck with bread making yet. but i'm so gonna try out yours. just a question, will it make any difference if i'm using normal non-organic milk? thanks! Thank you for the wonderful step by step instructions! I made homemade bread twice this week, the second time using this recipe (one loaf each time). My loaf pan was too big so I had a hard time getting it as tall as I wanted, but thanks to amazon's speedy delivery service, a new loaf pan arrived that looks remarkably similar to yours! (I like stainless steel so that's the only difference). Gonna give it another go tomorrow. Dislike buying bread and reading a list of ingredients as long as my arm :(. Fresh food = healthier and tastier! I made the sandwich bread yesterday. I am truly happy with the result. LOL I followed it down the line, no shortcuts, and I have found myself loving that bread. Thank you so very much for posting it. I am glad I found your site. Your pics are wonderful - wished I was there with you. Tomorrow, I will try my hands on the biscotti receipe. Biscotti are my favorite cookie of them all. I'm sorry to hear that your bread didn't come out right. Without knowing exactly how you made it, I can't say for sure what the problem is, but my first thought is that your yeast might have been dead. Did the dough rise the first or second time? If your dough didn't double in volume as per the instructions, the yeast is probably not good. If it rose too much (during the first and/or second rise), the yeast could have exhausted itself, and when you put the bread in the oven, the yeast had no energy left to rise up when it hit the blast of oven heat. Also be sure not to use warm, not hot milk or water, as it can kill the yeast if it's too hot. You can check the viability of active dry and instant yeast by putting a pinch of yeast and a pinch of sugar in a small cup of warm water (about 100°F). The yeast should start to foam. I recommend using instant yeast for baking bread. I buy it in economical one-pound packages (you'll find more info and a product link in the post above) and store it in a jar in the freezer, where it will last at least a year. I've never had good luck using the small paper envelopes of yeast you buy at the grocery store. hi, I love your bread recipe. This is a comment about your site. I found your recipe through google. But when I click any of the standard links I get to these comments and have to scroll up to the recipe. Then as I read iut, the site brings me back to the comments. You might want to have a look at the site to figure out what is going on. It's like I had to fight the site to see the (wonderful) recipe. I absolutely LOVE the site! I've recently started making my own bread, but I only bake for 1 person (myself) so I tend to scale down recipes a lot. I dug through the comments and found you'd posted a scaled down recipe for the sandwich bread recipe. It's doing it's first rise now. I can't wait to see how it comes out! The batches attempted by hand were ok, but not as flavorful as I'd hoped. However, tonight, I used my bread machine to mix the dough for the scaled down version of the recipe and baked it in a cast iron bread pan (I absolutely love that pan). I have found it needs more flour than most recipes, the dough is never dry enough, and yet, this particular batch came out perfectly. It's perfect. Thank You for your intelligence, investigations into better bread making and for your incredible recipes! You have a lot of thank you's, but this one is from me! I am a single Mom who lives to give wholesome food to her daughter, to have recipes we can build together, and to teach chemistry in a scientific and a food layering loving your taste buds manner to her daughter. I want my daughter and grandchildren to have a better food life than I... You Rock! Again, Thank You! Thanks for the recipe and great tips. I have been baking bread for 20-some years but just bought a "sandwich" loaf pan and am trying your recipe. Now if only I had a professional slicer! Hi, after reading all the wonderful kudos to your bread,, I am about to ask an almost sacraligious question. I'm wondering if it is possibe to do this wonderful bread in a bread machine, and if so, do I have to change any of the measurements? I love all your recipes and also your pictures of the farm. I'd love to see the Hunky fellow's face sometime. Thank you. Angela in N.J.
A month or ago I decided that I would no longer purchase bread for home consumption, and I looked forward to weeks of testing recipes for THE perfect loaf of bread. The one problem I encountered, I made this recipe first. I have now made this recipe three times and it is virtually idiot proof. My wife is an incredibly picky connoisseur of bread and she has issued a fiat directing me to make this bread ahead of any others I might make over the weekend. To be honest, I cant really complain it is that good. 1) I halve the milk and use 2 cups water and add 1/2 cup KAF bakers milk. 2) I use my Kitchen Aid stand mixer for the initial mixing (with the paddle) then for a couple minutes after the autolyse. (with the dough hook.) I'll finish it off by kneading the dough by hand for a few minutes afterwards. Thanks again for this terrific recipe. Ha, I love it. So glad you're enjoying the recipe. Thanks for the feedback and mixer tips! As a brief follow-up, I had to make a batch of bread entirely by hand recently (Read the direction on your mixer folk!) and let me tell you. This bread by hand is considerably better. So much so that when we get our mixer back I wont even bother to use it for this recipe. And it's not just the far superior texture you get but also the simple act of making the bread is far more satisfying, at least to me. This feedback is great. Thanks! It can be hard to convince people to make bread completely by hand, but the art of making it really is so satisfying. And for me, just getting out and then cleaning the mixer usually takes more time than just doing it by hand. Although I have a big KitchenAid mixer, I always knead my bread dough by hand, so I didn't know for sure how much of an effect mixing the dough would have on the bread. I love that you did a comparison. Like I said, great feedback! Great Recipe. I used 1/2 whole 1/2 skim milk and 2 TBS melted butter and got a great result. Nice Size for a 8.5 x 4.5 Pan. I tried the pizza stone trick and that seemed to work well. Next time I'm going to 1/2 the yeast and double the rise time. Just pulled these out of the oven an hour ago and cut into one of the loaves 15 minutes ago :-) Everything was easy and spot-on. The bread rose beautifully, baked in 35 minutes exactly and is incredibly tender. My only question is your bread is a beautiful golden brown on top and mine is a dull brown. The taste is great, it's just not as visually appealing as yours is. Any suggestions? I'm so glad you enjoyed Farmhouse White success! As for the brown tops on the loaves, are you making your dough with milk rather than water? Milk will give a deeper color to the crust. Also, if you look at the third photo from the top, can you see how there's a line along the top of that middle loaf where the color gets lighter? While the shaped, flour dusted loaves are proofing in the pan, I cover them with a damp tea towel, and that small amount of moisture on the dough seems to make the tops brown even more. And it may partly just be the color of the photos. You can see how the loaves in the top photo aren't as brown as the ones below. :) Happy baking! This recipe makes three 1½ pound loaves, which would be a little more than 4½ pounds of dough (there is a small amount of shrinkage during baking), so I would triple the recipe. Can't wait to try this today. :) Maybe I've missed it somewhere, but can I use a mixer with this recipe? Will it work in my Kitchen Aid? I use my Kitchen Aid stand mixer for the initial mixing (with the paddle) then for a couple minutes after the autolyse (with the dough hook.) I'll finish it off by kneading the dough by hand for a few minutes afterwards. Hope this helps. And if you do use your mixer, I hope you'll come back and let us know how it worked out. Happy baking! I love your site and your daily doses of whatever always make me smile. That being said; I have been making your Farmhouse White for the past 4 weeks and have finally begun to really get the hang of it. I used to make bread YEARS ago and recently started back with yours because I simply cannot pay the ridiculous prices at the store anymore. That and homemade is ALWAYS better in my opinion. I have a storage question for you: I am baking on sundays (3 loaves) and it lasts the week in our house. HOWEVER, now that the weather is getting warmer I am wondering if there is a better way to store the bread until it is used. I live in st Louis and I have been storing the loaves individually in ziploc bags just on the counter but I know it is going to mold if I keep doing this as the weather get warmer whether the a/c is on or not. In fact when I cut into the last loaf this morning to make a sandwich for lunch I noticed a tiny spot of mold on the crust. I just pinched it off, because the loaf will be gone by tomorrow night, but I'd rather not have it happen if I can prevent it. Is my best option to freeze the two loaves I am not using immediately and take them out one at a time? I tried to put the two unused ones in the fridge a couple of weeks ago but the quality of the bread was really compromised I thought. They were almost stale. Thanks for the advice AND the wonderful recipe!! I'm so glad you're enjoying the Farmhouse White - and everything else on Farmgirl Fare. :) Isn't homemade bread the best? Yes, bread storage can be tricky, especially here in Missouri. Fortunately this bread (as well as most others) freezes beautifully. As soon as the three loaves are completely cooled, I just seal two of them in big zipper freezer bags and toss them in the freezer. Defrost at room temperature and they're almost as good as fresh - and much better than if they've been stored on the counter or in the fridge. If any ice crystals have formed on the bread, simply brush them off the frozen loaf before setting it out to defrost. Whole grain breads (I'm hoping to have my Farmhouse 100% Whole Wheat recipe up soon!) have a tendency to mold faster than white bread, so in the summer I store the loaf we're eating in the fridge after the first day, but the texture really suffers and it's best if you toast the slices. I can't find the Farmhouse 100% Whole Wheat Recipe on the site is it under something else. I love the Farmhouse White, but would like to switch to the whole wheat. You may need more or less flour than called for in the white flour version. When starting out, you can always do 50/50 version with white and whole wheat flour to get used to working with the heavier dough. Just like with the original Farmhouse White, you want the dough as soft as possible without sticking to your hands and the work surface. I use a rolling pin to flatten out the dough when shaping into loaves to make sure there aren't any big air holes lurking in the finished loaves. Thank you so much for giving me this version. I will be making it tomorrow. The Farmhouse White bread is the best bread our family has ever had and always comes out perfect. I was getting so discouraged making bread and it never turning out, then I came across your recipe. Your recipe and instruction is perfect. Thank you very much. Loved seeing the little lambs. I just made this bread last night and I have to say...I LOVE IT. It's so moist. I had to actually use 2 zip lock bags over one another to cover ONE loaf. haha Thank you for such a great recipe! You're very welcome! Thanks for the feedback. I have been reading through the posts and I noticed a couple of posts where they were less successful for some unknown reason. I would like to suggest that you post some information that helps people compensate for the effects of altitude. Thanks for the suggestion, but I don't have any experience baking at high altitudes. I found your website yesterday by chance and I am absolutely in love with it! This recipe was fantastic, I've been trying to bake tall loaves of bread for quite a while and they never come out the height I want, using your recipe and baking in 2 pans resulted in AMAZING tall, moist bread. My husband is thrilled. P.S. I love the donkeys, they are my favorite animal! My dream is to own a small farm one day and I can't wait to have a few of my own. Thanks for the excellent site! Just tried your recipe for the first time. Turned out perfect! Great post!! I've been experimenting with different bread recipes lately and I'm about to try yours. I know you use instant, but I currently have a jar of active dry yeast. So I'm wondering how you suggest using it. Perhaps put the active yeast in 1 cup of warm water to foam up, and then add that with 3 cups of warm milk, into the well of flour? Does the milk need to be warm if I've already used water to separately activate the yeast? Should I add the sugar or brown sugar (or could I substitute 2 tablespoons of honey?) to the warm water and yeast...then add that to the flour? I just want to make sure I'm not doing anything that will mess up the rising. Thank you! Thank you so much! May I ask a couple more things? The warm liquid for the yeast to proof, is that 110 degrees if it's water...85 degrees if it's milk? And I saw you did a 1 loaf version in comments, would a 2 loaf version be like this? Sorry to ask more questions. There's just science involved here and I'm still a relative novice at making bread...but want to learn more and bake bread regularly. The milk and water don't have to be specific (or different) temperatures. You just want the dough to be about 70 to 75 degrees while rising. If you're going to proof the yeast in water that's 110 degrees (don't make it any hotter or you risk killing the yeast) the milk could probably be a little cooler than 85. It depends on room temp, temp of flour, etc (I store a lot of my flour in the freezer). So I'm loving your site and all of your recipes. I just made this bread for the first time last night, and it didn't turn out as well as I'd hoped, unfortunately. I'm not a novice baker, but it's been a few years since I've done much sandwich bread baking. My dough was very dense and tough to knead (although I added about a cup less of flour than called for). The dough was still slightly sticky, so I was confused why it was so dense, since I had to sprinkle a little flour a couple of times during kneading. I did accidentally use rapid-rise yeast (I've never used instant yeast before, and on the back of the rapid-rise yeast it called itself "instant yeast" so I bought that - but after reading about the different types of yeast I see I made a mistake!). The bread is very soft, rose beautifully, but is very dense and quite bland (which may be because of the rapid rise yeast?). So do you think my main problem was the yeast I used, or did I just add too much flour maybe? Thank you! I'm so glad you're enjoying my blog. If you liked this bread recipe enough to give it another go, I would definitely try using brand new instant yeast. Your dough may still have had too much flour; because everything from the brand of flour to the weather and the humidity can affect dough, it may sometimes take a lot less (or more) flour than a recipe calls for. I aim for a soft dough that doesn't stick to my hands and/or the counter. Often that means sprinkling a small amount of flour on my hands and/or the counter several times as I'm kneading. A little flour can go a long way. As for the density of the loaf, part of that may simply be this recipe. It's not a super soft, squishy sandwich bread like Wonder. Regarding the flavor, I recommend using a nice organic flour; it really does make a difference. Also, did you add the salt to the dough? Salt really brings out the flavor of bread. Are you using milk or water? Milk will add more flavor and also improve the texture. Lastly, this recipe is great for experimenting and adding things. I often use about half whole wheat flour (white whole wheat flour, which is still 100% whole grain, is lighter than 'regular' whole wheat flour). Even just adding 1 cup of whole wheat flour will give you more flavor. It's also fun to toss in 1 cup of wheat bran or oat bran. Update: I made this again, this time using King Arthur flour (which is what I usually use, but last time I didn't have it so I was using a different kind of flour). Anyway, it really seemed to make all the difference! I love King Arthur flour! The dough was lovely to work with, the bread was very soft and delicious... I did everything else the same, but the type of flour makes such a big difference - just a hint to anyone else out there who may be wondering. (the other baked goods I made using the different flour also turned out dense, so I know that flour was the problem). Anyway, yay! Success! Thank you so much for sharing this recipe. I made this today, and it is absolutely delicious. I have enough bread to last the 4 of us an entire week. I normally buy 3 loaves a week. So glad to have this recipe in my collection. I have been trying different recipes but usually they come out really dense and heavy, no matter what flour! /rising time,kneadindg time I use. This one was very light and tasty! Next, I will try to add some whole wheat flour since I don't like the flavor of white bread too much. Thank you for the recipe! So glad you're enjoying this recipe! Thanks so much for taking the time to let us know. I often replace at least a few cups of flour with whole wheat flour (and sometimes use up to 50% whole wheat) - it adds a really nice flavor. Hi, has anyone tried to make this in the bread machine. I have a dough setting and a start to finish setting and just wondered as I am a little too intimidated to try from scratch. What do you think Farmgirl? If I used the one loaf ratio? I don't have any bread machine experience, but I'm sure you could give it a try with this recipe. Use the one loaf ratio, but I would check and make sure that a 1½ pound loaf isn't too much for the machine. Thanks for the feedback. I'm so glad your husband loves his Farmhouse White. And I'm so sorry you can't eat it! Storing fresh bed can be tricky, especially if, like us, you live somewhere that's very dry in winter and insanely humid in summer. A lot of people recommend storing bread - especially crusty loaves - in brown paper bags, and/or wrapped in cloth, but that doesn't work for us in either season. What I do is put the bread in a zipper freezer bag and store it on the counter. If it's a whole grain loaf and the weather is warm, I leave the bag slightly open, otherwise the bread seems to mold faster. No matter what, I only leave the bread out on the counter for two or three days. If it's not gone by then, sandwich loaves go into the fridge - and I always toast bread that has been refrigerated. When I bake more than one loaf at time (which is nearly always), the extra loaves go into the freezer (just placed straight into zipper freezer bags) as soon as they are cool. If you don't go through sandwich bread very quickly, you could always cut a loaf in half and freeze the other half. Hi! I bake a LOT and just recently made it a profession. I am learning to conquer my fear and inexperience with yeast breads and just found your recipe here a few days ago and decided to go with it, I made your homemade bread last night (all 3 loaves) and they turned out so beautiful! I am very happy with the way they turned out so thank you for sharing your delicious recipe! I feel so much better about working with yeast now. My bread seems to be vertically challenged. I let it rise in perforated baguette pans, and it doubles in size quickly, but when I go to bake, afterwards it doesn't rise during the bake as much as I would like. Any thoughts? Ha - I like the term vertically challenged. And we've all been there with bread! :) It sounds like your yeast had exhausted itself by the time you put your loaves in the oven. Try letting the shaped loaves rise about 10 or 15 minutes less than you have been. When you gently poke a floured finger into the risen dough, it should still spring back a little. It's better to err on the under proofed side, rather than over proofed. You can also experiment by putting the three loaves into the oven at three different times, but remember that you lose a lot of heat each time you open the oven door. ahh great advice, I have been erring on the side of waiting longer on the proof, not knowing that over proofing was a problem, I am excited to get back and try. Thanks for the help! OMG, very yummy! My wife Shelly loves this! Hi i've just baked this bread today and it smells so great! I might have overproofed before baking though since it has risen very little in the oven, or less than i'd expected! i thought overproofing was safer than under haha. Anyways i need your help! I was thinking of substituting some all purpose flour with wholemeal flour or oats or oatflour! Can i know how to substitute them in specific amounts? And i'm baking them for my dad who does not like a strong grain/wheat taste so i'm wondering which, wholemeal or oat flour, would be a better choice? He eats them with spreads too so yeah! Hope to hear from you soon and thank you so much for your lovely site, i've learnt more about baking bread! I'm so glad you're having success with this recipe! Adding whole grains is a great way to give your Farmhouse White bread a healthy boost. I often make it using 4 or 5 cups of whole wheat flour. White whole wheat flour is 100% whole grain but a 'lighter' variety of wheat, so it isn't quite as heavy when baking, but regular whole wheat flour will work too. You can start by using as little as 1 or 2 cups in place of some of the all purpose flour and work up from there. Keep in mind that whole wheat flour will absorb more liquid, so you may need to either use a little more milk or a little less flour. When I'm making a 100% whole wheat version of this bread (someday I will properly post the recipe!) I use 5 cups of milk instead of 4. I haven't made it with oat flour (which you can make yourself by simply whizzing old-fashioned rolled oats in a food processor), but it should work fine. You don't want to use too much because it will affect the crumb. Try just 1 or 2 cups. You can also add bran. I make a honey whole grain bread that uses 1 cup of wheat bran and 1 cup of oat bran. The great thing about this recipe is that once you've mastered the basic formula, the variations you can try are endless. Happy baking! Ok...first time with the basic white was lovely. Now it's time to beef it up a bit with some whole grains. Thanks for a great basic recipe and some good baking tips. Wow!! This bread is wonderful! I cook it with a pan full of water on the lower rack of my oven and the bred turn out scrumptious! Thanks, I'll be rebloging your recipe on my French Canadian Blog! Awesome bread! I used your option to replace 1 cup of flour with 1 cup of cornmeal flour. It gave it a slightly grainy texture, making it heartier. Fantastic toasting bread. Thanks so much. Your posts are written with such a warmth and passion I feel as though you are sitting in my living room with me. Last year I devoted four weeks of my life to making bread from Tartine's bread book. We had some of that fabulous bread in San Fransisco. I made a huge mess several times a week and the trials were a bust, so I gave up and started using Jim Lahey's method. The bread is great, but it does take a day for rising.....so I'm looking forward to making yours this weekend. By the way, your green tomato salsa is famous in my neighborhood and I have a bumper crop of green tomatoes this year....no reds and the temps a falling each evening. Boo....Thanks for the recipe and the great tutorials. After trying to make a GOOD loaf of bread for 4 years I tried your recipe and it was my first successful loaf . I am going with the larger bread pans next time and leeting them proof a little longer. The texture and flavor is great. Thanks...I was about to give up. I have been wanting to try this recipe forever, and finally I did. You are right, it was so easy, and it was a huge hit with my family. Thank you so much for putting this out there for us. My family cannot thank you enough! Wow, this is an awesome recipe. This is my second time to make it. The flavor and texture of the bread are wonderful. On the first go round I made two regular loaf forms, third loaf I just gave it a ablong form and it turn ed out beautiful.It looked and tasted as thou I had purchased it at a French Bakery. Thanks for sharing. Just wanted to say thank you for this recipe and the step by step. Been making this recipe now for a few months after being fed up with store bought breads. Luckily, we have a food mill not too far away, so I am able to buy local grains and flours. I make the white recipe for the kids, add honey for dinner rolls and cinnamon rolls. I took the advice for using wheat flour and oat flour, but then also add wheat bran and ground flax (staying within the bread ratio in the recipe) for the 'grown up's' version. Better than the double fiber... ever. I found this recipe when it was on the Year in Bread site. It was the first bread to work for me, ever! When I wanted to add the recipe to my Family Approved Recipe book, I found it here and I am so glad you moved it here! I did not realise the other site was gone. So, thank you for preserving it here. I've passed this recipe on to friends so many times! And, I've given it away, made it for company potlucks ... always a hit. The last time I took it to work I rolled it out and spread cinnamon, sugar, butter and raisins inside, rolled it up and shaped into loaves. I topped the finished loaves with a confectioner's sugar glaze. Do I have to say I from two loaves I had no leftovers! This is a great base recipe everyone should know. I've stumbled upon your blog about almost a year ago and have probably made your bread recipe more than ten times to the point that I know it by heart! There was no turning back to commercial bread after tasting the first batch. My boyfriend always asks for this bread and I would keep loaves upon loaves in our deep freezer as he loves making sandwiches. Made this recipe for a family gathering, a total hit I might add, and now I am expected to bring buns for any family gathering! ^_^ Thank you for sharing this recipe and the bonus detailed step-by-step instructions! Do you know of any similar bread recipe that's gluten-free? My 4 year old nephew just recently was diagnosed with celiac and commercial gluten-free bread is so expensive. I'm so glad you're loving the Farmhouse White! Thanks for the feedback. Made my first batch of Farmhouse White today and it is delicious. Thank you! Thanks for your feedback - I'm so glad you enjoyed the recipe! Made this recipe yesterday and still have that smile on my face, my best bread yet, thank you. This one is a keeper for sure. I do have one question, the 20 min rest period, would it still be 20 min regardless of yeast used? I used a lazy tablespoon and it all turned out great but just wondering if the rest period is dependant on yeast used or not or will 20 min be written "in stone". As for the 20 minute rest period (autolyse), that's a good question. I pretty much always do about 20 minutes, regardless of the recipe I'm using, the amount of yeast, etc. You basically just want enough time so that the water absorbs into the flour, but not so long that the dough really starts to 'officially' rise. Sometimes I let it go a little longer than 20 minutes (by accident), and it still comes out fine. Thanks for this recipe! I am new to baking bread (I just started this week) and your recipe was the third I tried (and most successful). I'm going to keep baking it for a while, and then try the substitution tips you recommended. I've become obsessed with baking bread - it's so fun! Thanks for all your helpful tips. This is a great recipe! I totally went out on a limb and made my own tweaks. I made a batch of BUNS, with all WHOLE WHEAT all purpose flour. I also added FLAX and SUNFLOWER seeds. They turned out fantastic! The recipe yielded about 24 good sized buns. This recipe is definitely making it into my book for recipes that passed the test! Enjoy! Woohoo - here's to going out on bread baking tweaking limbs! :) Your buns sound fantastic. Thanks so much for the feedback. Stumbled across your blog just a few days ago and loved all your recipes. You have so many wonderful ideas and offer substantial trouble shooting! What a fantastic recipe! I am pretty new to bread making and thanks to your easy to follow instructions and pictures I had no problem at all. Made a batch following the recipe yesterday and it turned out fantastic. Mom and sister asked for some, so I am baking some today as well. Made a whole wheat batch and another white with roasted garlic. Both turned out great! Thank you for publishing such an easy and what seems to be fairly fool proof recipe. Love your website. I made a single loaf of this bread yesterday and it turned out lovely! But it did come out just a bit on the dry side. Any suggesttions for making it a little more moist? adding butter maybe? Yay, bread success! To make your bread a little less dry, my first suggestion would be to try reducing the baking time slightly. If you make more than one loaf at a time, you can slightly stagger the time you put them in the oven by a few minutes, which will allow you to compare the results. thanks! I will give that a try next time! I only have red star active dry yeast. I am starting with the 1 loaf recipe and need to know if there is a measurement and or process variation for this. I was one of those kids lucky enough to have a grandmother who was a fabulous baker. Unfortunately, she NEVER used a recipe...lol. I can still smell the bread baking in her kitchen. This recipe describes the closest ingredient list that I have managed to get from the last of the living relatives that noticed any of her ingredients.BTW, great site. I could love you! I have made so many loafs of bread and they never turn out quite right. Either the sides smoosh in (which you explained nicely why!) Or they just don't taste good, or they are dry, or they have big holes in them when cut or the texture is not right.. This is the very first time I have ever had success with bread making. I am soooo excited (and so are my kids) I only made one loaf because I didn't want to waste 3 loafs if this recipe didn't turn out. I made it to go with pea soup and let me tell you the kids about ate it all (with the exception of the one slice I ate to test it out) before I could even get dinner on the table. There are only 4 slices left and I told them not to touch them its for me and daddy.... I cannot even tell you how excited I am to have found this recipe!!! I just discovered this site and want to thank you for all the hard work you have put into it. I was laid off from work about 8 weeks ago, and was looking for a way to 'stretch' a dollar, so to speak. I have some retired friends that are trying to do the same thing, and after sharing your site with them, we all are so excited! We want to get together and try your recipes, and get back to the way life should be. The best to you and yours! I tried your recipe out yesterday for the first time. I love it! I only have one loaf pan, so I used the measurements you had given in a couple of the comments to make just one loaf. My kids and my husband loved it! I had barely half the loaf left over that i left on the counter in a ziplock bag. Unfortunately, plastic bags are not cat proof and our two kitties had a hay day tearing it apart and nibbling a bit, then spreading the rest around the kitchen floor while we were sleeping last night... I'm making another loaf today, and will put it in the cupboard from now on! :) Thanks for sharing your recipe! Ha, that is too funny. That reminds me of a cat I had years ago (before I started baking my own bread) who loved freshly baked bread so much she once climbed into the back of our little convertible, ransacked the grocery bag while I was carrying other ones into the house, tore into the plastic bag holding a fresh loaf of struan bread and ate a big chunk. Farmhouse White is the ONLY white bread that I will make. It turns out fabulously every time, freezes superbly, and my family devours it. I just made four loaves--they're cooling now--and I couldn't resist helping myself to a couple of slices coated in butter and strawberry jam. Love this recipe. Thank you so much!!!!!! I have made this bread many times and we have always loved it! I made it today and since I was out of fluid milk, I used non-fat dry milk. Boy did I use dry milk. I don't know where my head was at, but I put in 3 3/4 cups powder and 4 cups water! The bread didn't rise as high and the crust got very brown, the crumb is creamy yellow and soft but the crust is very chewy (tough?). I couldn't figure out what I had done wrong until I was reading another recipe and it said to use 3 Tbsp. dry milk. It immediately dawned on me. Anyway, this bread is pretty foolproof as the bread still tastes amazing and it certainly has plenty of protein! My brain takes a vacation sometimes when I'm doing something it thinks it already knows how to do. I will stick to your recipe and pay attention next time. Love this bread! Thank You. Oh my gosh, that was a lot of dry milk, lol. Talk about your calcium enriched bread. :) I'm so glad it still came out edible - and I'm so glad you're having such delicious success with the recipe. Thanks for the feedback! I want to make rolls for Easter. I have made the Farmhouse white in loaves and had great success! About how many rolls will this recipe yield? How large should each ball of dough be? Would it a good idea to roll each third into a log and slice with floss? I plan to make them early, put them into cake pans and freeze until Sunday. How should I bake them - from frozen or thawed? Thanks for all the advice. I'm so glad you're enjoying the Farmhouse White - and it makes delicious rolls. You can make the rolls any size you like - about 2 ounces each is a nice size. (In comparison, I make burger buns that are 4 to 5 ounces each.) Some people divide the dough for rolls into pieces about the size of a walnut. Just experiment and see how big you like them. This recipe gives you about 72 ounces of baked bread (slightly more before baking because you lose a little water weight in the oven), so if you made 2 ounce rolls, you would end up with about 3 dozen. You could try the log/floss method, but it would probably be easier to simply divide the dough into two or four pieces and then divide those pieces into rolls. I cut each piece of dough in half, then in half again, etc. I use a pastry/dough scraper to divide dough for loaves and rolls. It's also great for cleaning off your work counter. You can spread the rolls several inches apart on a baking sheet or in a pan, or place them closer together for 'pull apart' rolls. I personally don't have very good luck freezing bread dough and then baking, so I prefer to bake the bread/rolls and then freeze the finished product. If you want to try freezing the pans of rolls, I would shape the rolls, put them into the pans, freeze them before rising (proofing), then defrost them at room temperature and let them proof before putting them in the oven. This could take several hours. Alternatively, baked and frozen rolls can be defrosted at room temperature and then reheated for a few minutes just before serving. Thanks so much for the excellent advice. I'll let you know how it turns out! Another option would be to par-bake (partially bake) your rolls, freeze them, and then finish baking them just before serving. This is a popular technique in the commercial baking industry - a lot of 'freshly baked' bread you buy in supermarkets is actually made somewhere else, par-baked, frozen, and delivered to the stores. The in-store bakery bakes off the frozen loaves and voila! freshly baked bread. It works especially well for baguettes, etc. What's nice is that you can go directly from freezer to oven - no waiting for the unbaked, shaped rolls/loaves to defrost, proof, etc. and yet it's still freshly baked. For rolls, I would underbake them by about 5 to 10 minutes, depending on the size (I bake 4 to 5 ounce burger buns for 20 to 25 minutes total). You want them to be fully risen and just starting to brown. Thanks again for everything, Susan. The rolls were wonderful and came together so easily. What I ended up doing was making one loaf of bread and two dozen (3 round cake pans) rolls. I baked them off completely, cooled them and then placed them in the freezer. The only thing I did wrong (wasn't thinking) is that I defrosted them the night before in the refrigerator when I should have let them thaw at room temperature Easter morning. About 15 minutes before dinner (while the roast was resting), I put them in a 350 oven (on the pizza stone) and they turned out warm and delicious. Thanks for making me look good! So glad you had delicious success! Thanks for the feedback. I'm now making rolls every Sunday for the week. This recipe provides about 40 rolls (about 2 ounces each). I bake them, cool them completely, then put them in a giant ziplock bag in the freezer. We just take out what we need and they last us for about a week. The kids love them in their lunchboxes. The most time-consuming part is forming all the little rolls. I don't even really need to have them rise because by the time all of them are rolled, they are plump and ready for the oven. Made this today and it turned out wonderfully! My first successful attempt at bread baking! I was getting so tired of reading the hideous ingredients on bread labels in the grocery store and thought it was time to learn how to bake bread! Thanks so much for the recipe!!! I have four little boys and a hungry husband, all of whom are picky eaters. I make this bread at least twice a week, as they go through one loaf in a day. That's how yummy it is. I love, love LOVE this recipe. I like that you can use all organic/ local ingredients so you know exactly what you are feeding to your family. Sometimes I'll replace some of the flour with old fashioned oats, powdered by my blender. It adds some fiber and a nice, nutty flavor. I've used your blueberry bonanza bar recipe also. Just amazing. I'm enjoying browsing your website. Thanks so much for sharing your delicious recipes with us! Several years ago I started making homemade bread, and while I thoroughly enjoyed it, I didn't keep it up. I have just recently started again by making a few loaves of the Farmhouse White, and I am having a blast! It is especially great having what seems to be a pretty forgiving recipe. Even when it may not be "perfect", it still tastes fantastic. I am wondering though, if you can help me get a better sense of what I am looking for in the dough when adding the last bit of flour in the kneading process. I understand that the dough should be smooth and soft. It seems like I will achieve soft, smooth dough early in the kneading process, but then will start getting some sticky patches. When it seems sticky, I add more flour. Other times, it's not so much that the dough is really sticky, but it seems fairly tacky. The dough is not sticking to the counter, and not really sticking to my hands as I knead, but as I said, a bit tacky, especially just below the surface. Should I keep adding flour at that point, even if the surface seems pretty smooth? The dough is easily holding its shape at this point. One other question: do you use/recommend the window pane test? I can get the dough to "pass" other tests for sufficient kneading. The dough is smooth, it holds it shape, and if I poke the dough the indentation fills back quickly. But, I can't quite get a good window pane - it is tearing, almost breaking/snapping, when I try. Even as I try to work out some of these details, it has been a lot of fun baking bread and both my partner and I enjoy eating it. Thanks for sharing these recipes and tips! I'm so glad you're enjoying the Farmhouse White! It sounds like you're right on track with the kneading. Basically you want to keep the dough as 'wet' as possible, without letting it stick to the counter or your hands (and adding as little flour as possible when it does). The softer (wetter) the dough, the nicer the crumb. 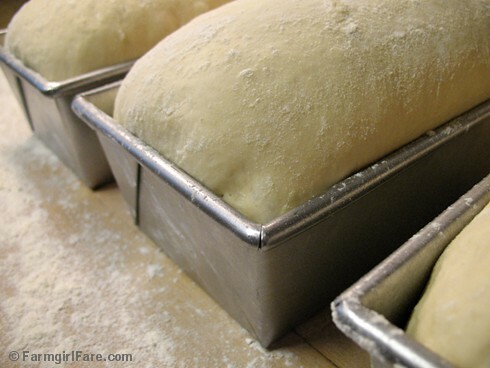 A heavy, dense dough will give you heavier, denser bread. Just wanted to suggest a possible solution to keeping the dough soft but still being able to work with it. Having a dough scraper nearby is a great help when trying to keep from adding too much flour when the dough is tacky or sticky. I use it floured or wet depending on what type of dough I'm working with. hope that helps a bit. Yep, buttermilk should work fine. If you don't want quite that much tang (or your buttermilk is on the thick side), you could use half buttermilk and half regular milk or water. I made this today for the first time - it all seemed to be going well - and I didn't give it the full 40 minutes rise after shaping so as to not run the risk of over-proofing but I still didn't get much rise at all in the oven - I did everything else to the letter according to the recipe - measured it all with digital scales etc - any ideas? Havent tasted it yet but still would love to get that full rise - I am using quite a large loaf tin - prob just over a 9x5 inch pan - maybe that is the problem - but don't have a smaller loaf pan at the moment. If you like how the bread tastes and want to make it again in the same size pan, I would suggest simply making a heavier loaf. 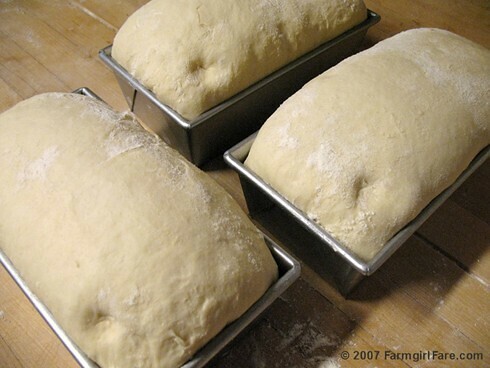 If you're making three loaves at once, make just two loaves instead and see how they come out. Happy baking! Hi--I'm just starting out making bread and came across your recipe for Farmhouse White. For the milk, what would be the tradeoffs in using whole and 2% milk? In other readings, there seems to be a consideration to fat (butter) and liquid when baking and I was interested if reduced fat milk could be used as is or other adjustments were needed. Thank you. Any kind of milk should work fine in this recipe, without making any other adjustments - or you can even make it with water. Happy baking! Can you please tell me how many pounds of dough do you put in each size of the pans you use to get really high/tall loaves? Mine never rise very much. I use 100% grains I grind myself. For this recipe, I make three loaves that are approximately 24 ounces (1½ pounds) each - you start out with slightly more dough than that before baking, as some of the water weight evaporates during the baking process. I use pans that are 8½" x 4½" inches - smaller than many loaf pans. Depending on the recipe I'm making, I'll sometimes put up to 34 ounces of dough (over 2 pounds) in each loaf pan. Thank you for such a quick response! I purchased the 10 x 5 x 3 pan (the one you recommended that holds 1 1/2 pound). How much dough do you put in that one? Do you have a recipe for 100% whole wheat? I've put up to 34 ounces of dough (a little over 2 pounds) into that size pan. The loaves won't come out as tall as they do in the smaller pans (it's amazing how much difference an inch or two in pan size makes). You could probably make an even heavier loaf, though if you're using 100% whole grain, you might want to stick with 34 ounces or less. I'm sorry, me again! If I wanted to use 1/2 WW flour and the other 1/2 the white flour from your recipe, would the WW flour replace the all purpose or bread flour? Also, if I were to use the 9 x 5 bread pan, would I use the amount of dough as the 8 1/2 x 4 1/2 pan would? I know that you said using 100% WW flour doesn't give a very tall bread, if using part of each, would that make it higher? You can replace either the ap flour or bread flour with ww flour, but the bread flour will have more gluten, so it should help the heavier whole grain dough rise. Using just half ww flour should definitely give you a taller loaf than 100% ww. I made it that way for a long time before finally switching to 100% whole wheat. You can use the same amount of dough for each size pan, or use more in the larger pan if you want - experiment and see how you like the results. Happy baking! Love the comments for all the wisdom and experiences people share. It should make my effort more successful. My question has to do with using ancient grains like Spelt and Einkorn in the bread recipe. We do this b/c we are sensitive to modern wheat but these simpler grains don't cause problems in moderation. I'm going to use a combo of White and sprouted Spelt flour and just a bit of the Einkorn flour. I'm thinking to use the whole wheat measurements and method since the sprouted flour looks more brown like whole wheat. (The other 2 look just like white flour) Do you have any recommendations which recipe I should try? Thanks in advance for any help. I love that you're going to try this recipe with ancient grains - I'm hoping to start experimenting with them soon. Basically the ww version just has more liquid - whole grain flours absorb more than white flour. I would probably just go with the ww version and use the 5 cups of milk, though you may have to adjust the amount of flours you use. I always keep the liquid constant and vary the flour, which is different pretty much every time I bake, depending on the weather, humidity, etc. I hope you'll come back and report on your results - I'm anxious to hear how the ancient grains bake up! Update: both whole sprouted spelt, white spelt and eikhorn flours work beautifully in this bread recipe. I do a couple of extra things differently for these flours. One is to autolyse the dough with just the water yeast and milk for 20 minutes. This helps with hydrating the whole spelt flour so that you don't add too much extra flour or liquid. I add the butter and salt after that 20 minute period. Otherwise I just rise for 1 hour in the bowl after kneading . Then shape and rise a second time in the pan for 45 minutes. I've made loaves of bread and buns and rolls. All had great crumb. Your Farmhouse white was my first attempt at loaf bread and it turned out very good. Thanks. I'm the one who asked last month if whole or low fat milk was OK. With your advice, I used non-fat milk since it was already in the frig, doubled the recipe using your one loaf conversion as a base, and used two 1 1/2lb loaf pans. After they cooled from baking, the tops were a little wavy and discovered small air pockets at the top of the loaf. I probably should have rolled it out a as you suggested in your post "How to shape bread dough..." But what counts is my wife, who was raised in the country on homemade bread, thought it was great. Not bad for a city boy. Now to try dinner rolls for Thanksgiving. I am from a very small and hot village in South Africa. My local store only has cake flour. Is that ok to use? I made your Farmhouse White yesterday for the first time and although I've been making bread, on and off, for about 40 years and been moderately successful with wholemeal breads I'd never succeeded in making a satisfactory white loaf. Yesterday I succeeded. The bread was all I could hope for - it looked like a shop bought loaf but tasted very home made. In the past my white bread has failed to rise enough, whether that was down to me not giving it enough time or other reasons I'm not sure. The autolyse seems to help and I took your advice and bought a thermometer but I think your finger test is probably as reliable. It did take up most of my day but that was mainly waiting for the dough to prove. Being English I used metric quantities rather than cups and organic strong white bread flour instead of all purpose and extra strong white bread flour instead of bread flour. I also added about 1 1/2 tsp of Vitamin C to help the rise but I may leave this out in future to see if there's a difference. I shall certainly be making this again and will try your oatmeal toasting bread next. I might try adapting some of the granary and wholemeal recipes I have used successfully before to incorporate the autolyse method as I think this really makes a difference. Thanks for your very detailed descriptions and photographs as they really help in knowing what to look for and how the different stages should appear. I'm so glad I found your website and I'll be visiting lots in future. I'm so glad you had delicious success with my Farmhouse White! Thanks for all the great feedback. Can you tell me about using the stoneware loaf pan with baking bread? I read where you said never put a cool stone in a hot oven and wasn't sure how that works with the rising? I've heard that stoneware is good for baking and considered purchasing one. Any advice would be appreciated. Wow! This bread worked out beautifully. I have been having so many problems not ending up with bricks, and this one is wonderful. The only problem is that everyone wanted to live on toast for a few days after I made it! I am going to try one of your suggested variations today. Thank you so much. I have made bread for over 20 year. This is the best white bread recipe I have ever used. Great results!! Also thank you for sharing the 10 tips very useful information for bread making. Was wanting to try your recipe out but I only have traditional yeast and am sorta old fashioned myself so would I just use some of the liquid and proof the yeast before hand and just follow your ingredient list? And how do I lighten that sourish taste bread made with milk gets. From peviously tried recipes - not so bad the first day but the second is worse. Thank you. R.
Hi! I was wondering about damp tea towel to cover the bread to rise for 40 to 60 minutes. Do you mean for me to wet the towel and covering the bread for last rise?